A mound of old papers under a pile of brick dust in the attic of a seacoast Maine house — a treasure trove of maritime history waiting over a century for discovery by a person uniquely able to appreciate what he had found, and who could interpret it to the world. The Gillchrest family letters and business papers reflect the lives of a Thomaston, Maine extended seafaring family and community, which built, managed, and sailed ships to distant ports around the world (1830 –1870). The Gillchrest Papers opens a new portal into Thomaston history. Through his vast knowledge of maritime history and his observations gleaned from transcribing discovered letters exchanged by a leading 19th century Thomaston family, Renny brilliantly brings their voices into the present, telling in first person of the life and times of hard-driving sailing ships and their captains—facts unknown by any until now. I highly recommend it to all 19th century seafaring historians and enthusiasts alike! Come aboard, stow your gear and get ready to go on a 19th century maritime adventure. This collection of letters takes you on an adventurous voyage and has you standing right next to some very remarkable and accomplished individuals as they dealt with the demands and vagaries of 19th century life and the business of ships and cargos. After growing up on Nantucket and at Mystic Seaport, with an MA in maritime history, Renny Stackpole taught history at New England prep schools, and served as curator of museums at the Nantucket Historical Association. 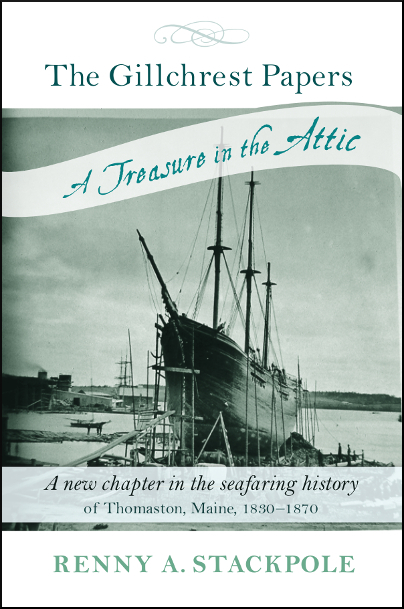 It was after moving to Maine to help with the restoration of the schooner Bowdoin in 1985 that he discovered the cache of papers that is the subject of this book while exploring his house. He is director emeritus of the Penobscot Marine Museum, and is a past-president of the Thomaston Historical Society.